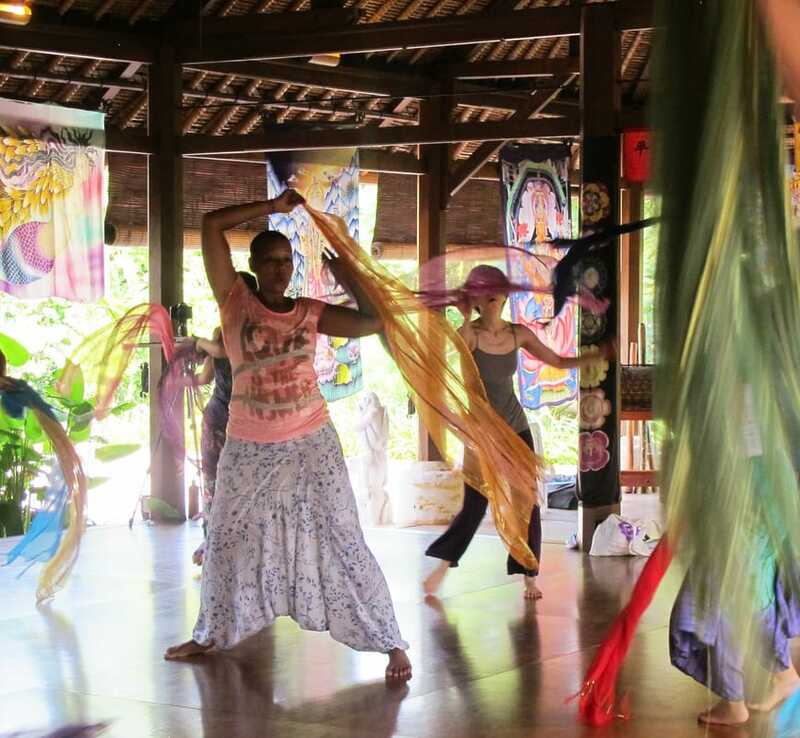 "In celebration of womanhood and the new Bumi Sehat clinic, we offer this seven day course in perinatal yoga, massage & dance, learning how to tailor our healing arts practices to mother's needs from the gestation period until after child birth." Teachers: Ellen Watson, Indra Widjanarko, AmyBell Agex & our special guest Ibu Robin Lim. Date: This program has been postponed to 2018, express your interest below. Join Ellen, Indra, and Amy, for Celebrating Womanhood’s immersion into the time before, during, and after childbirth. Learn how to take care of yourself, your family and friends, your clients, your students. What a wonderful gift to yourself and to all women in your personal or professional life. Whether for personal or professional development, this program is for all women, of all age, and for the men who love them. During the program, Ibu Robin, Guerilla Midwife, founder of Bumi Sehat (Gentle Earth: Gentle Birth leads to Gentle Earth), will join us for a session, sharing inspiring stories from her lifetime of delivering babies in Indonesia, and the Philippines. Winner of the 2011, CNN “Hero of the Year’ award, Robin, with the support of her global network, generated sufficient resources to build the new Bumi Sehat. Located in Nyuh Kuning Village, an easy walk, through the Monkey Forest Sanctuary, to Ubud’s shopping and eating streets, Bumi Sehat is an open air birthing center, with an upstairs studio for our program. Due to the remarkable physical changes, the added weight carried in the front of the body, lower backs, shoulders, legs and feet of pregnant women call for touch. In this program, we will have 20 hours of hands on practice of simple and effective bodywork techniques for relieving tension and tightness in the affected muscle groups. From conception to 2 years after the baby is born, so much time is focused on the baby that mothers often feel forgotten or treated as an accessory. This can commonly lead to muscle aches and pains, stress and become a causing factor of post-par tum depression. Post Partum techniques for helping with scar tissue will be covered. We will include techniques for relieving shoulders, arms & hands. In this program, we will have 20 hours of hands on practice of perinatal massage, learning specific bodywork techniques for relieving tension and tightness in affected muscle groups. Helps alleviate pregnancy discomforts, provides pain relief and promotes a healthy baby and mother. Uplifts the spirits of the mother, giving a boost to her energy, supports physical and metaphysical well-being. Of great benefit to both Mother & Child. Stimulates the release of endorphins, dopamine, serotonin, and increases levels of oxytocin. These chemical and hormonal changes producte results in fewer birth complications. Reduction in stress hormones balances moods, improving cardiovascular health and further stress reduction. If you are interested in this program and would like to be updated with more information send us a quick message here. For registration please scroll to the bottom of the page. Ellen will be joined by AmyBelle, an Indonesian BellyDance teacher. Belly Dance, is a perfect fitness practice for women of all ages, and particularly for women before, during and after childbirth. Most babies in utero, enjoy dancing with their mothers! When Mother dances, so does baby, and when Mother hums, sounds, and sings, the vibration engages the child. SpiritDance SoulSong is Good Medicine for Mother & Child. Expression through movement can be a great way to learn and explore an alternative form of communication to talking. Music therapy has shown through tests repeatedly to have a beneficial effect on parent and child, commonly recognized through the 'Mozart Effect' to improve spacial-temporal reasoning. Dancing before giving birth can help to get the baby into the optimal position for birth as well as preparing the mother for birth movements. Also helping to relieve stress and strengthening the community of mothers, bonding through communal activities. Mother's dancing with their babies helps to bond with the child, rebuild core strength and balance and re-align joints and ligaments following birth. Indrawati Widjankaro (Indra), will lead us in asanas, pranayamas, and mantras chosen specifically for women in support of making the birthing process an enjoyable, loving, and pain-free experience. Additionally, classes will offer post partum asanas with breath, in support of returning muscular strength. Modifying classic yoga practices to suit the mother's needs and abilities helps to work alongside massage and dance to provide and maintain a greater sense of well being. The applications of presence and detachment can help the mother to seperate the pain of childbirth with the joy of the experience. Exercising deep pelvic muscles through Asanas not commonly explored, prepares these muscles for their extensive work throughout childbirth. Pranayama excersies teach mothers to control the breath. As with other areas of practice throughout this program, we will learn which breathing exercises a mother should and shouldn't do. For many women, pregnancy yoga can be a first introduction to yoga. Around the world, women join to enjoy the social activity with other mothers on the same path, and discover the powers of yoga along the way. Combined, these 3 healing practices work together to provide amazing experiences in pregnancy and child birth. In creating this program, we wish to share these practices with the staff at Bumi Sehat to help expand their knowledge and abilities in Perinatal healing arts, to share in their incredible new clinic. The pricing for this program does not currently include accommodation options. We have a range of local accommodation to suit different budgets very close to the clinic in the Nyuh Kuning area. If you would like our assistance in booking rooms we may help to pair you with someone else joining the program for a twin room close by. Otherwise, if booking yourself be sure to find a location within walking distance of the clinic for daily practice. Pricing includes all tuition, welcome and departure group meals, lunch on 3 days, a donation to Bumi Sehat for the use of their space (note that we will of course welcome further donations to the clinic). If you have any questions on what is included and not included, where to stay, etc. feel free to Contact Us to find out more. Standard pricing: USD $950- before early-bird and local discounts. Early-Bird: $150 discount valid until September 15th! Local Discount: ​Contact Us with a photograph of your Indonesian ID or KITAS Residency card for an extra special discount. To make payment, simply click "add to cart" below and proceed to checkout to complete your order. If you have any MovingVentures discount coupons you may apply theses at checkout. You will also need to complete the registration form following the link below. Be sure to fill in all details as accurately as you can to help us.